The Xperia Z4 is still on its way, but while we wait the Japanese brand has taken all the sophisticated design language and shoved it into the mid-range Sony Xperia M4 Aqua. Although this release won't sate those of us clamouring for a top of the range Sony handset with killer specifications, if you like the look of Sony's Xperia Z range but don't want to drop kind of cash its asking price requires, then the Xperia M4 Aqua is one for you. The Xperia M4 Aqua goes on sale for €299 (about £220, $340, AU$435), which is a fair bit cheaper than the nearly year-old Sony Xperia Z3, and this lower price tag means the Xperia M4 Aqua sits in the middle range of handsets, going up against the likes of the LG Magna and the Samsung Galaxy A5. Although it's a resolutely mid-range phone with a price tag and specifications to match, the Xperia M4 Aqua shares a lot of design language (and waterproof smarts) with the flagship Xperia Z range, giving a premium look and feel to an affordable handset. Can this phone prove you can be midrange without being mediocre? If you're familiar with Sony's previous Xperia handsets then there'll be no mistaking the Xperia M4 Aqua's origins, with a sleek and square design that's very similar to the Xperia Z3. The "OmniBalance" design – as it's called by Sony – is designed to allow the Xperia M4 Aqua to look and feel good no matter how you hold it, and it's just as successful as with the Xperia Z3 and Xperia Z3 Compact. From a distance you'd be hard pushed to identify the M4 from its more expensive brethren, though on closer inspection you'll notice that the M4's body is made from polycarbonate material, rather than the metal of the Z3. That doesn't mean the M4 Aqua looks or feels cheap – far from it, as the premium design makes this one of the best looking mid-range phones. Only the Samsung Galaxy A5 (which pulls a similar trick of utilising the metal design of the more expensive Samsung Galaxy Alpha) gives the M4 Aqua a run for its money in the looks department – at this price range, at least. The 145.5 x 72.6 x 7.3mm dimensions result in a large phone that accommodates a 5in screen, but it's far from unwieldy. Combined with the 136g weight of the polycarbonate body and you have a handset that sits comfortably in the hand. 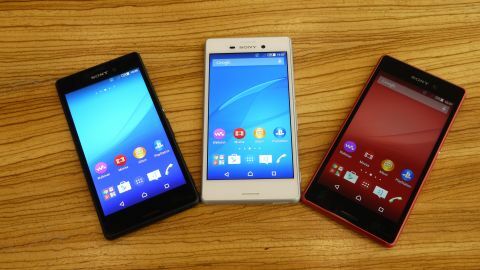 While the bezels on either side of the screen are relatively thin, the top bezel, which contains a front facing camera, speaker (for phone calls) and Sony logo, and the bottom bezel, that features a microphone, are both rather large, which gives the feeling that the handset is slightly longer than necessary. As well as the front facing camera, the top bezel also features a small LED light that flashes when you receive a notification. These lights change colour depending on the type of notification and some apps such as Facebook support this feature, letting you know what notification is waiting for you without having to turn the screen on. It's not quite as flexible as the curved side screen of the Samsung Galaxy S6 Edge, but once you get to know the colours, it's not a bad little additional feature. The power button sits in the middle of the right-hand side of the body, which means that even people with smaller hands will be able to easily reach it, with the volume rocker just below. A dedicated camera button is also present and correct, and as with the more expensive Xperia models, this is a welcome addition. In case the "Aqua" part of the name wasn't enough of a giveaway, this handset is also waterproof, which means much like the Xperia Z3 the microSD and SIM ports are covered to prevent water entering. The covers are easy enough to remove (and remain connected to the handset when open, so you won't lose them), and keep the body looking rather stylish and smooth, though they can be a bit fiddly to work with when in the dark. Admittedly the instances when you'll need to swap out a SIM or SD card in the dark could be few and far between, but finding the USB power port in the dark is a more common occurrence. In previous water-proof Xperias this charging port was also covered which did cause frustrations. Happily Sony has managed to make this (along with the headphone port) water resistant without the need of a cover on the M4 Aqua, so finding it in poor lighting conditions is much easier. The M4 Aqua can be picked up in three different colours; coral, black and white. The device I had was in the coral hue, which is a dark pink shade and looks rather fancy. Overall the design of the Xperia M4 Aqua is excellent, and Sony has done a good job of keeping most of the premium design language from the more expensive Xperia Z3 on this cheaper device.